We are pleased to offer our Guests Fiber Internet! 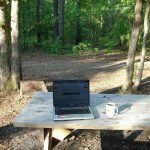 Camping in the great outdoors of East Texas used to mean that guests had to deal with little or no Internet. That changed in August 2018 when we were able to complete our upgrade from a very slow DSL connection to Fiber. While you can still disconnect from the world if you choose you can also stay connected with our complimentary Wi-Fi at your campsite. We have 6 access points located through out the park for good coverage even with all of our trees. We have tested Wi-Fi reception through out the park and there is an adequate signal at each of our sites. Logging on is as simple as opening your browser and entering the user name and password given to you at check in and it will allow up to 3 devices. As with any network connection, speed does and will vary depending on the number of users and the traffic on the system. Our system automatically divides bandwidth equally between users to provide a good connection. Please read our Wi-Fi user agreement located here. Come enjoy the simple life. Rayburn RV Hideout has fiber Wi-Fi.